Ms. Sicily Kanini Kariuki (center), Principal Secretary, State Department of Agriculture, Kenya, discusses the State’s agricultural priorities with Dr Bergvinson and Dr Siambi. Diversifying crops and diets to include nutri-cereals like millets and sorghum, attracting youth to farming, unlocking the potential of digital agriculture and creating economic opportunities for smallholder farmers, were some of the key issues that Kenyan government officials, partners, entrepreneurs and academicians discussed with Dr David Bergvinson, Director General, ICRISAT, who visited the country in mid-April. Both Ms Kariuki and Dr Bergvinson agreed that enterprise diversification for high-value nutritional products needs to be strengthened. Dr Bergvinson talked of the need to create economic opportunities for farmers. “We are working with entrepreneurs in Kenya using the Agribusiness and Innovation Platform to build up the next generation of entrepreneurs who can identify processing and marketing opportunities for these commodities,” he said. Emphasizing the importance of creating awareness about nutrition and diversification of diets, Dr Bergvinson spoke of the ICRISAT approach centered around the value chain framework. It ensures there is a good understanding of the consumer’s as well as farmer’s requirements and using that to deliver the right solution. 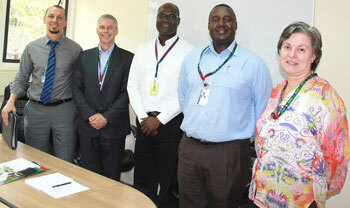 The Ministry and ICRISAT will together plan on how to execute the value chain country strategies being developed. Using a business approach; identifying the right partnerships and working with small and medium enterprises (SMEs) who see a bigger opportunity in this, would be the best way forward. A roundtable discussion with key stakeholders, including the private sector, will be organized as early as possible. Dr Bergvinson with USAID officials. Use of digital technology, including mobiles. USAID team said that their main focus was on sorghum, millet and groundnuts, and they were looking at strengthening the entire value chain to reach their goal of getting 500,000 households in Kenya out of poverty. 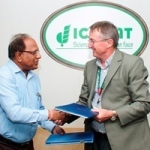 They indicated that they are in talks with different CGIAR Centers, ICRISAT being one of them, to bring them all in one group and work on a project (the others are International Livestock Research Institute, International Institute of Tropical Agriculture, International Maize and Wheat Improvement Center and International Potato Center). Dr Bergvinson met the senior management team at the World Agroforestry Center (ICRAF) in Nairobi and discussed possible areas of collaboration such as: green water management, bringing crop components into systems research, using digital technology to support systems integration, testing and promotion of sorghum in semi-arid areas (particularly intercropping with green gram and cowpea), and research on climate smart agriculture. Meeting with ICRAF senior management team in Nairobi. Dr Simon Carter, Regional Director, International Development Research Center (IDRC), said their focus was on impacts at scale, partnerships and leadership. Dr Bergvinson spoke of ICRISAT’s country strategies, which he said will be useful in articulating what is needed at the country level and in identifying the right partnerships to work with and help achieve impacts at scale. “We want to be a partner of choice for donors,” he stressed. 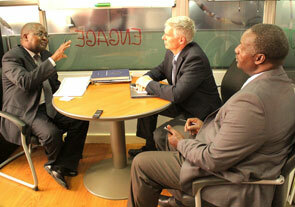 Dr Bergvinson in discussions with the IDRC team. Dr Moses Siambi, Regional Director, Eastern and Southern Africa, ICRISAT, briefed the IDRC team on the plan to increase utilization of sorghum and millets by creating awareness of their nutritional value, as well as work with small-scale enterprises to develop value-added products. Dr Carter stated that starting with nutrition at the center to drive productivity was a “great idea”. He suggested that ICRISAT consider the use of social institutions (eg, health officials) to deliver the messages to consumers. Sorghum and pearl millet processors based in Nairobi. In a meeting with sorghum and millet processors based in Nairobi, Dr Bergvinson acknowledged the important role of processors in the value chain. In his remarks, Dr Bergvinson gave a brief about ICRISAT’s plan to create structures based around value chains and to commercialize sorghum. “I am excited about this program, it started in India as an idea, came to Africa in partnership with other partners and now we are discussing the challenges and opportunities that we see here in Kenya,” he said. He informed participants of an interaction he had earlier with the Principal Secretary, Department of Agriculture, who was very happy about the new opportunities around sorghum and millet value addition. He referred to sorghum and millet as “smart foods” saying that diversification of these crops will help create economic opportunities for smallholder farmers. This requires a host of partners coming together with research organizations such as Kenyan Agriculture & Livestock Research Organization, ICRISAT, and processors. The processors are members of the agribusiness incubation program of the Sorghum Value Chain Development Consortium (SVDC) and the ICRISAT Agribusiness Innovation Platform (AIP). 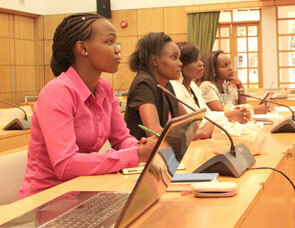 The team from SVCDC and AIP were also present at the meeting. Research on farming systems and livestock, using ICRISAT mandate cereals and legumes for livestock fodder and feed. Capacity building through co-supervision of masters and doctoral students using ICRISAT’s research skills, research facilities and germplasm. Modernizing knowledge dissemination through on-line courses, with UoN acting as a regional catalyst in this process. Need for building capacity of researchers to meet future demand as many of the present staff are on the verge of retirement. 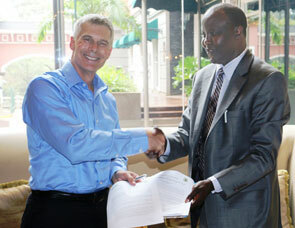 Development of country strategies, involving the private sector and agricultural universities including UoN in Kenya. Mr Makai said the company’s focus areas included financial services (providing credit facilities to smallholder farmers), information dissemination including sharing best practices with farmers (on subscription or on demand), supply chain and access to market. Dr Bergvinson highlighted ICRISAT’s interests and activities around digital agriculture including mobile technology, remote sensing GIS technology and genomics. Use the mobile platform to increase awareness among consumers about nutritional value of traditional crops such as sorghum and millets and grain legumes. This will create new market opportunities. Create economic opportunities for smallholder farmers and processors through the use of mobile technology to support market integration and equitable market, especially for the commodities that have been displaced. Knowledge exchange through digital communication with farmers – exploring opportunities for pre-loading information on a SIM card so that it can reach the farmers quickly. During Dr Bergvinson’s visit to the ICRISAT genomics lab in Nairobi one of the suggestions made by the DG was to distill rainwater instead of tap water and take advantage of the soft water from nature that would improve most of the lab processes. 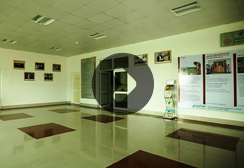 The lab, hosted and shared jointly with ICRAF, was renovated and expanded in 2014 to accommodate the recently launched African Orphan Crops genomics activities. The last stop on his visit was the sequencing lab, where the African Orphan Crops Consortium (AOCC) is currently supporting the sequencing of highly nutritious, less researched African crops, jointly with ICRAF. Dr Bergvinson was particularly impressed with the finger millet whole genome sequencing under the AOCC projects and coordination of the activity with counterparts from Bengaluru, India. At a luncheon meet organized by the staff to celebrate Dr Bergvinson’s 100 days in office, the Director General thanked the team for their support in developing country strategies and meeting with partners. 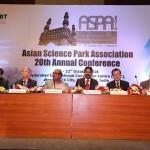 “We need to raise our game on science, and through partnerships achieve impacts,” he urged. Mr Makai in talks with Dr Bergvinson. 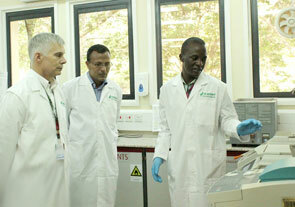 At the genomics lab in Nairobi.